My faith in Johnny Depp has been restored. 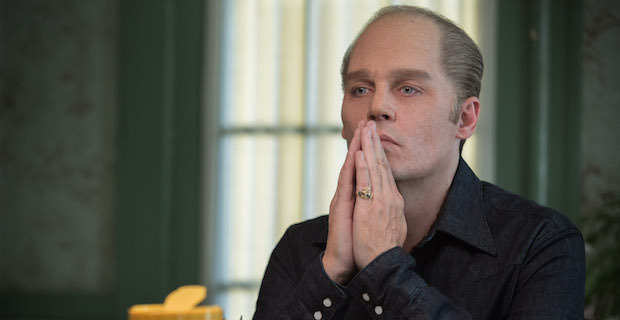 At its best, Black Mass is a platform for Depp to showcase every ounce of acting talent his recent works have denied him the opportunity to use. The smirking oddball actor who bounced around Pirates Of The Caribbean, Alice In Wonderland, and even last year’s Tusk has completely disappeared into a quiet, yet menacing figure. James ‘Whitey’ Bulger terrorized the city of Boston for well over a decade, and Depp embodies his twisted spirit to the fullest extent. The plot of Black Mass attempts to cover nearly sixteen years of Bulger’s life, from his early days running crime in the streets of Southie, to the moment he realizes he must flee his beloved city in order to remain a free man. It’s an ambitious undertaking that transpires in just under two hours, which requires the film to more or less skim through what could be considered Bulger’s greatest ‘hits.’ We learn of his deal with FBI agent John Connolly (Joel Edgerton) first, as well as Bulger’s reputation prior to becoming an informant, followed by the seemingly endless crime spree that took Boston by storm. We also learn of Bulger’s personal life, including the loss of his young son, and we bare witness as Whitey’s inability to come to terms with that loss only serves to fuel his ever-present rage. It’s not the seminal Bulger story some might have been expecting, but it’s a far more elaborate take on the notorious gangster’s life than anything we have seen projected on the big screen before. Time constraints are ultimately what prevents Black Mass from being more than just another well made crime drama. Director Scott Cooper has spoken at length about sequences he ultimately cut to better focus the narrative of the story, but considering the runtime and the events he attempts to cover in the film you get the idea he might have trimmed a bit too much. Instead of allowing the story to unfold in a natural way, Cooper relies on a series of expository cutaways that feature excerpts from interviews with the film’s major players as they rat on their former boss. It’s a creative way to tie in the numerous interviews conducted to create the book that serves as the film’s source material, but it ultimately restrains the story from conveying the true weight of Bulger’s actions. We never see anything that tells us his reign of terror is advancing, nor do we catch any glimpse of how the city as a whole is reacting to his crimes. Things simply happen, be them brutal or not, and then we move on. Black Mass does not celebrate the life of James ‘Whitey’ Bulger, and that is largely for the best. It would have been very easy for Cooper and his team to present Whitey in a light akin to Scarface or another iconic silver screen gangster, but thankfully the film has too much respect for Bulger’s victims to cash in like that. In fact, we never have much, if any, reason to like Whitey Bulger. He’s a seething, ruthless monster from the very moment we meet him. There is venom in every word he speaks, and he’s careful to make sure he chooses each syllable carefully. He may be smarter than your average criminal, but he is in no way better. He’s much, much worse, and Black Mass does its best to capture his essence in a way that never makes him cool. What keeps Black Mass engaging is its cast, which features pretty much every other major player in Hollywood today. Depp is the true star of the show, evoking a presence we have never seen from him before, but without strong turns from actors at every level there would be far less to praise overall. Even the bit players, like Adam Scott and his maybe three lines of dialogue, leave an impression with the viewer. There is a conviction to everyone’s performance that lifts the material from the depths of genre tropes and makes a strong argument for everyone to give a damn. You know where things will end up from the start, or at least most do, but the performances keep things lively throughout. Though I do believe there is a lot of history and source material that could have been used to improve the narrative, Black Mass is an undeniably well-crafted film that features a career-defining performance from Johnny Depp. The film outside of Depp and his cast mates may be little more than by-the-numbers genre fare, but thanks to strong performances from everyone involved there is more than enough reason to stick around until the credits role. Just don’t go in expecting a new Goodfellas because this is not that. It’s quite the opposite, truth be told, and that is part of what makes the film so great. We have never seen a gangster story quite like this before, with the exception of The Departed (which is loosely based on Bulger’s life), and it’s something we could use more of at the movies today.